The accolades of athletes have been sung high and low since the times of ancient Greece and long before. Following are some of the greatest feats that professional athlete have ever performed. This Ethiopian Double Olympic Champion is by far one of the greatest endurance athletes of all times. He broke numerous records in the men’s 10,000 and 5,000 meters. He then went on to become the first man to ever complete the Marathon in under 2 hours and 4 minutes. This was at the Berlin Olympics back in 2008. Forever hailed as the man who threw a wet blanket on the fires of Aryan Supremacy when he took four gold medals in the Berlin Olympics in 1936. While this was memorable, his greatest feat was when he broke three important world records in under on hour. 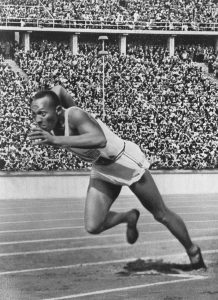 Jesse Owens broke records for the long jump, 220-yard hurdles and 22-yard sprint in Ann Arbor Michigan while competing for Ohio State — and all in one hour. Nadia Comaneci realized her impressive athletic feat while performing at the 1976 Montreal Olympics. Comaneci won all but four of her 9 Olympic Gold Medals that year and while this was a feat in itself she went on to win a more daunting challenge. The hockey ghosts of the Montreal Forum were legendary judges and she was the first gymnast ever to receive a perfect 10 for her performance. Perhaps one of the greatest legends in athletics was the surreal moment when the Englishman Roger Bannister ran a mile in under 4 minutes, 3:59:4 to be precise. The celebrated feat occurred at Oxford University and was a sensational moment. Many of the spectators believed they were watching a physically impossible performance. Previous PostPrevious Is Cheerleading a Sport?